Slash and Les Paul. Or Slash the THE Les Paul. However you say it, they go together like milk and cookies. And next month in Cleveland, Ohio, Slash will play at the Rock and Roll Hall Of Fame's tribute concert for his guitar hero. The former Guns N' Roses guitarist says he's committed to doing anything he can for the 93-year-old Paul, known to many as the "Father of the Electric Guitar." Paul's many contributions to music include building the first solid-body electric guitar in 1941. 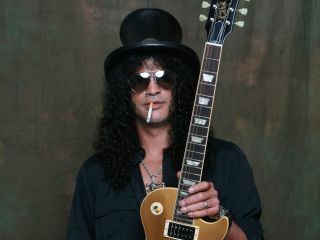 Slash says he's played with Les Paul in the past - and he's not to proud to say he couldn't keep up with him. The concert, to be held on Saturday, November 15 at the PlayhouseSquare's State Theater, and which will also include performances from ZZ Top's Billy Gibbons, The Ventures and Richie Sambora, is part of a weeklong tribute to Les Paul at the 13th Annual American Masters series in Cleveland. For ticket information, visit the Rock Hall website.